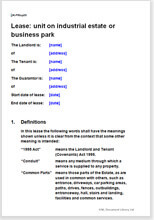 This is a lease for a building on an estate or park where the tenant shares facilities and services with others. The unit could be a factory or workshop, or a storage facility or warehouse. This document should be used to let an industrial unit such as a workshop, factory, depot or warehouse that shares common facilities and services with other units let by the landlord to different tenants. Commonly, this lease would be used for a unit on a small- to medium-sized estate, whether industrial or commercial in nature. Paragraphs within the lease provide for recovery of service charges such as for security, access, and utilities. If you don't need provision for service charge recovery, see this alternative lease. This is one of a collection of commercial lease templates designed for use by property professionals: experienced landlords, solicitors and surveyors. Accordingly, the provisions are very thorough. We offer another version for a unit on a park or an estate, which contains fewer technical provisions, fewer warranties, and less extensive service charge provisions. Within the guidance notes we provide a discussion on use of security deposit agreement and a template for one. We have also included the forms required to exclude security of tenure. These include the prescribed notices to be given to the tenant 14 days before the new lease is created, a declaration of a new lease, and the statutory declaration if less than 14 days notice is given. If the length of the term is for more than seven years, the agreement must be registered with the Land Registry. We provide prescribed lease clauses at no additional cost that you can add to your document. There is no need to use these if your intended term is seven years or shorter. "I found using Netlawmans website very helpful and user friendly. When sourcing legal documents to assist our business needs, I found it very quick and informative. The whole process was completed within minutes." "Paul Adams Associates Legal Services has used Net Lawman online legal documents on numerous occasions and have found their service to be very efficient and cost-effective. I have no hesitation in recommending Net Lawman to my associates."